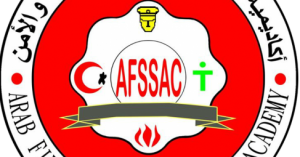 Arab Fire Safety & Security academy offers one of safety training courses represented in extensive safety training courses which is one of qualifying safety training courses of AFSSAC . Who should take this safety training ? Safety engineers and foremen. Also supervisors who supervise safety works in big companies , factories and ministries . – Preparing cadres in the high level of safety. – Acquiring the sensitivity of the search for knowledge, assemble and classify it. – How to implement training programs in various fields of safety in all levels and in various activities. – Ability to characterize surrounding risks and damages and in the workplace. – Identifying how to characterize practically to solve safety problems. – Gain the ability to lead discussions and transmit the spirit of competition between the working groups. – Ability to recognize work risks (physical, chemical, mechanical engineering and radioactive materials) that may be incurred in the work environment and protection requirements of each of these risks. – Ability to identify and assess the risks of workplace in accordance with international standards and standards of the International Labor Organization. – Identifying the causes of accidents in the work environment. – Ability to investigation and analysis accidents at work. – Developing the knowledge of the most important principles of first aid. – Ability to issue work permits each according to existing risk after showing what the potential risks are. – Gain the ability to program and deploy preventive awareness. – Developing the knowledge of how to use the latest methods, systems and devices used in the evaluation and measurement of safety operations. – Identifying the importance of natural and artificial ventilation of the work environment and workers. – Proper use of tools and equipment for individual protection. – Shed light on the ways and objectives of storage. – Identifying the scientific basis for collecting, discharging and treatment of industrial waste. – Identifying the principles of occupational safety and health of the employees and how to apply them. – Identifying the most important principles of first aid. – The ability to provide first aid to the injured in the work environment. – Acquiring the ability to create enthusiasm and loyalty to the safety work among others. – Identifying the safety precautions of pesticides. – Studying of industrial psychology and its impact on production rates. – Shed light on the psychological factors and their impact for work injuries. – Gain the ability to develop prevention and protection plans from analyzing and measuring safety. – The beginning of the safety and its fields. – Safety requirements in buildings. – Accidents (definition – causes – accident investigation). – Ventilation and its types. – Tools and equipment for individual protection. – Tidying and cleaning of the premises and work tools. – Collecting and disposing of waste. – Methods of accidents prevention in industrial facilities. – The basic principles of first aid. – Measuring and evaluating safety. 1. Educational level: General secondary Certificate and its equivalent. 2. Basic Requirements: No basic requirements. 3. General Requirements: physically fit and healthy. * Duration of the program: three months – five days a week -360 training session (50% theoretical 50% practical). * Training language: – Arabic with the use of scientific terms in English. 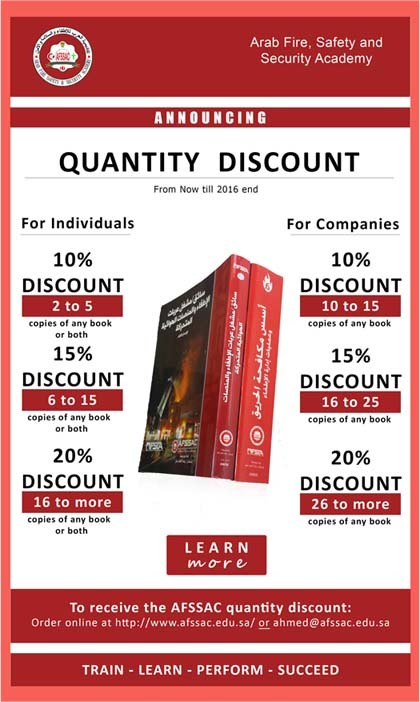 – Each trainee passes the course, gets a certificate from the Arab Fire, Safety and Security Academy locally approved by the Technical and Vocational Training Corporation and internationally approved by the World Congress of Safety and Fire Services IFSAC.